marked to save you alignment headaches and installation time. No Order too small, we fill them all! Mr. Shims precut 304 stainless steel shims provide years of alignment protection in highly corrosive atmospheres and environments. Saves you money, too! There's no cutting, deburring, retrimming, or wasted material. We have the right shim size for practically every alignment problem. 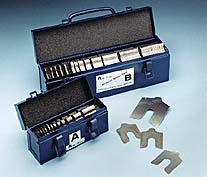 Each shim is precision made to exact dimension size and tolerances. It costs you far more to hand cut shims than to use a Mr. Shims precut products. 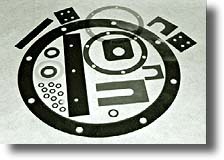 If you need a special shim design, we can help you solve the problem with a custom shim made to your specifications. Click on a section link below to jump to that section. STRT means Starter Kit. Click to see kit contents. EX= Full Kit addition of 10ea, .250". Mini Kit addition of 5ea, .250"
FOB Shipping Point, Terms 1/10/30, 1-800-72-SHIMS. .250 is sold in packs of 5ea, 10ea and 20ea. Custom shims to fit your special needs! Call us or fax your drawings and requirements for a fast, efficient quote, and service. State what material you wish (we have a variety), thickness and quantity of each thickness. We've helped a number of customers obtain very specialized shims that have solved demanding application needs. Remember, we're only a phone call away.